(pro'be sid'ee ah): from Greek proboskis:, a nose or proboscis; and idea: appearance. The mammal order Proboscidea was described by C. Illigeer in 1881 and was named according to its most noteworthy characteristic, the trunk (Latin proboscis), although the earliest proboscideans lacked trunks. 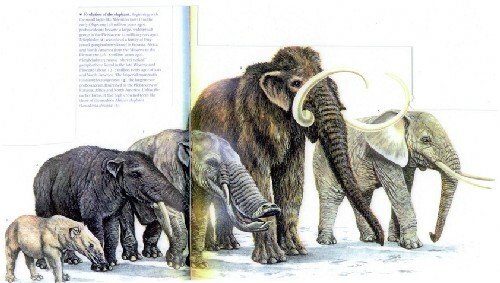 This mammal order belonging to the Tethytherians evolved in Africa during the Eocene, abt 60 million years ago and is the highway for the evolution of the elephants. 1942: Henry Fairfield Osborn identified 352 living and extinct species within the group. Later Hezekiel Shoshani recognized 177 species and subspecies divided in 43 genus and over 10 families. Recently Sanders one new genus and five species as been added, making 182 species belonging to 44 genus. The oldest proboscidean is Anthracobune, from early or early-middle Eocene (�50 million years ago), was found in africa and asia, in shore or semi-aquatus shallow environments, but Proboscideans inhabited a wide range (North America, Asia, Europe, and Africa) (Kalb, Froehlich, and Bell, 1996).